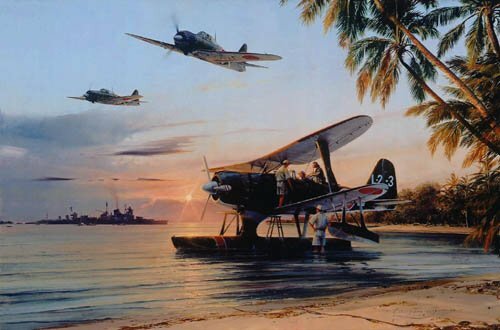 Robert Taylor's limited edition Dawn Operations captures a typical Pacific wartime scene during one of those few tranquil moments when conflict seems a million miles away. As dawn breaks over the naval base on the island of Shortland, off the southern tip of Bourgainville, a Mitsubishi F1M2 float plane is readied for its first reconnaissance flight of the day. Overhead a pair of A6M Zero fighters from a nearby carrier head out on patrol. Lying peacefully in the harbour a pair of cruisers prepare to sail. It is October, 1942. Overall print size: 26" x 20"